A series of murders in New York City puts Detective Riley Starr on the heels of an elusive killer. Riley's pursuit takes her to a place that she never expected to go, and forces her to look into the past to understand events that may defy comprehension. 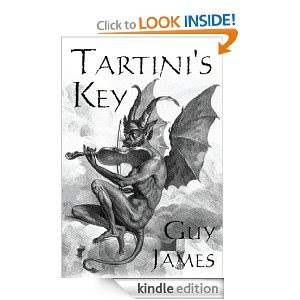 Part thriller and part murder mystery, Tartini's Key is a fast-paced, action-driven novel that will keep you at the edge of your seat until the shocking conclusion. Guy James is the author of Tartini’s Key, Sven the Zombie Slayer, and Rats on Strings. He lives and writes in New York, New York. “Tartini’s Key”, which is a detective book dealing with murders combined with mystery in a very creative way of language, is a very strong example of its kind. The book keeps you awake with tension and action that it offers throughout the story. We can also see a strong and self-confident female character (Riley Starr), who is the protagonist of the book, with both of her weak and powerful sides as a human and a woman facing with her past and present. At the beginning, I couldn’t exactly understand what was going on (maybe I was distracted and couldn’t gather my wits; this sometimes happen to me), but the events occur in a fast pace and you feel the excitement, especially at the end. If you want to get some goose bumps, I recommend “Tartini’s Key”, because you will never get bored of this book! BUY IT: You can buy this book (Kindle edition) on Amazon for $2.99.